Our bumpers are made specifically for heavy duty applications to handle anything you throw at them. 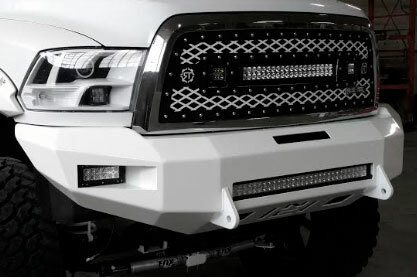 Protect your truck and enhance its look with winch-ready duty or low-profile beauty bumpers. All of our bumpers are entirely designed and hand built in-house from start to finish by our team to ensure perfect fit and function. Our bumpers are made entirely from precision cut 3/16” plate steel, offering superior strength and comparable weight to aluminum bumpers. All of our products are welded on the front and back of every seam, adding a level of durability you won’t find anywhere else in the industry. In addition to our standard black powdercoat or raw steel finishes, any bumper can be custom powdercoated in any color, or to match your truck’s OEM paint color. Our winch-ready duty bumpers are built tough to accommodate rear-mounted winches, which provides a clean, sleeker appearance and straighter pull angles, but won't interfere with airflow to your radiator. Our beauty bumpers are constructed to the same standards as our duty bumpers, but offer a 30-pound weight savings and lower profile appearance for those who don’t need a front winch. Custom colors are matched to order, please contact us for more information.